Airlines are turning downward once again. Delta Air Lines Inc. ($DAL) continues to trade lower, down -3.31% at $40.74 on a volume of 4,505,530 shares today. Last week we saw a brief rise in airline stocks that looked to be a bottom and a breakout. That breakout has now turned into a break below the lower bollinger band which is a very bearish move. There looks to be more downside in these stocks. Delta Air Lines Inc. is below the 50 day moving average and below the 200 day moving average. These are bearish, bearish indicators respectively. Delta Air Lines Inc. Delta Air Lines Inc provides scheduled air transportation for passengers and cargo throughout the United States and around the world. The Company’s business segments are airline and refinery. Get daily technical analysis videos from expert trader Dan Fitzpatrick. I understand that by registering below, I’ll get free, immediate access to this valuable resource, including all future Chart of the Day videos, along with hundreds of Dan’s past chart analysis videos! Safe and Secure! Your private information will never be traded, rented or sold. As a member of Stock Market Mentor you’ll learn alongside the best traders in the world and get an "insider's view" of the simple Stock Trading Method that is helping seasoned and beginning traders grow their portfolio safely and quickly! Join Dan and our trading forum community to give feedback, share trading ideas and experiences. Access an ever expanding library of over 140 educational videos. Video price alerts are sent to members as stocks covered in our Strategy Sessions and Chart of the Day videos. Sometimes you just want Dan’s input on a chart. No problem, just send a request for Dan to cover the chart. Each month I host a ”Members Only” Question and Answer webinar where I get deep and personal in helping individuals solve their problems..
Members receive an extensive “Strategy Session” video of profitable trading ideas each evening, which is typically 20-30 minutes long. 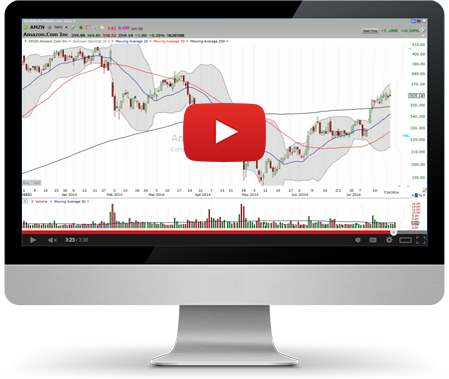 Members receive a more extensive analysis each weekend, with exclusive video content, including: a market overview, sector spotlight, Stock Watch videos and more. Got a stock you want Dan to look at? Just ask. © 2019 Stock Market Mentor All Rights Reserved. Reproduction without permission prohibited.